Having just made history by guiding Wales to Euro 2016 Qualification, we thought that now would be a great time to look back at Swans old boy Chris Coleman. Townhill product Coleman, started his football career as a YTS trainee with Manchester City in the summer of 1986, but after failing to settle in Lancashire, returned to his hometown club in March 1987 to continue his apprenticeship. In September 1987, he signed professional terms with the Swans and in light of Terry Phelan’s departure, become Terry Yorath’s first choice left back at the club for the 1987/88 season at the age of just seventeen. He made his Swans debut in the 2 nil win at Stockport County in Barclays League Division Four on 18 August 1987. With the experienced Tommy Hutchinson playing in front of the rookie Coleman in left midfield, the wily Scotsman nurted the youngster through his first season and they formed a great understanding playing on the left flank together. During his time at the Swans, Coleman worked his way through the Wales international ranks, from youth to U21 level, and had his first taste of European football against Greek side Panathinaikos – as the Swans were crowned Welsh Cup winners in May 1991 after defeating Wrexham at the National Stadium in Cardiff. That Welsh Cup Final game, would see Coleman wear a Swans shirt for the last time. At the end of the 1990/91 season and aged just 21, Chris was voted the best left back in the Barclays League Third Division by his fellow professionals. It was his performances during that season, which would see him soon on his way to the higher echelons of English football. 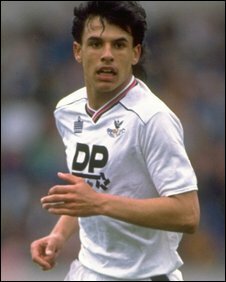 ‘Cookie’ as he is affectionately known – due to that fact that he (allegedly) has a cookie tattooed on his bum – made 160 appearances for the Swans and scored five times, before signing for then First Division Crystal Palace (whilst the Swans were in the Third Division) in July 1991 for £275,000. It was during Coleman’s time at Palace that he won the first of his 32 Wales international caps, making his debut and scoring in the 1-1 draw with Austria in Vienna on 29 April 1992, after coming on as a substitute for Eric Young. His manager at Crystal Palace, Steve Coppell, gave the left back the opportunity to play a central defensive role and even on occasions that of a central striker! It was during this stage of his careeer that his aerial strength came to the forefront of his game. Coleman’s career continued to flourish and in December 1995, he signed for Premier League Champions Blackburn Rovers for £2.8million, thus triggering a clause in his sell-on contract, which earned the Swans a nice £800k – which was a welcome addition to the Vetch Field coffers! In December 1997, Cookie was on the move again, this time signing for Kevin Keegan’s Fulham for a £1.9million fee and becoming the club’s record signing at the time. He quickly became club captain and helped Fulham to secure the 2nd Division Championship and then promotion to the Premier League under Jean Tigana. Unfortunately in January 2001, midway through the 2001-2002 Premier League season, Coleman suffered multiple fractures to his right leg, in a car crash near his home in Surrey. Despite attempting a comeback in Fulham’s reserve side, Coleman’s last competitive football appearance was for Wales in May 2002, when he came on as a late substitute for Robert Earnshaw in the 1-0 win over Germany. Sadly, Coleman aged just 32, was fored to retire from the professional game in October 2002, as a result of the injuries he had sustained in his car accident. 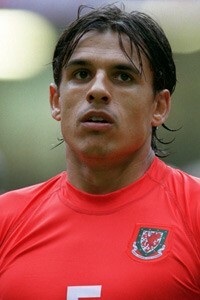 However, rather than move away from the game he loved, Coleman took up a role on Fulham’s coaching staff. This was to be the start of a journey which would see him eventually move into the Fulham hotseat, as caretaker manager, in April 2003. Coleman the manager quickly showed the football world that he was a manager of the modern era and led Fulham to safety in the first instance, and then in his first season steered the Cottagers to a 9th placed finished. Things didn’t go quite go so well in the seasons that followed and depsite saving Fulham from relegation, he was duly sacked in April 2007. Having earned his managerial stripes at Fulham, Coleman went on to manage Real Sociedad, after being recommended to the club by fellow Welshman and former Real Sociedad manager John Toshack, Coventry City and Greek side Larissa. On 19 January 2012, Coleman was unveiled as the new Wales manager to replace his close friend, the late Gary Speed. His first game official game in charge of Wales was a 2–0 defeat against Mexico in New York on 27 May 2012. Cookies appointment was exactly greeted with huge enthusiasm and early results did little to help, with the 6-1 drubbing at the hands of Serbia in September 2012 springing to mind. His tenure to date has not been an easy one. Who will forget the boos and early calls for his head during the current campaign, when Wales were struggling to beat Andorra – thankfully a late winner from Gareth Bale meant that episode has since become a distant memory. But throughout all the flack, the battling Coleman stuck to his beliefs and was rewarded by the biggest prize (in the last 57 years at least) by taking his Wales team to the European Championships in France next June. It has to be said that the whole team, from Coleman, the backroom staff and the players, have indeed been “Together Stronger”.